Time flies when you’re having fun! It’s been more than a week already since #GlasgowCycleInfraDay17 and after such a phenomenal response it has mostly spent reading and re-reading Tweets, whilst staring at a spreadsheet, trying to figure out how best to put them together in to the story of Glasgow’s cycling infrastructure. As you might expect, most of the submissions were negative. If you’re familiar with cycling in Glasgow you can probably imagine them; pictures of potholes and flooding, of cars parked in cycle lanes, of busy roads with no infrastructure and of barriers blocking access. Perhaps more surprising was that around one in eight of the Tweets were positive. With so few examples of truly segregated cycling infrastructure in Glasgow, you sought them out and held them up as examples of what you need. Unfortunately it’s not all good news. Poor maintenance, flooding, and in some cases bad design decisions all meant that the negative feedback for segregated infrastructure outweighed the positive more than 2-to-1. Whilst the Council might believe that they are ‘leading the way in the UK regarding implementation of segregated cycle facilities‘ the results of #GlasgowCycleInfraDay17 would suggest there’s a way to go still. First up, there will be another blog post here shortly focusing on the details of some of the worst examples from #GlasgowCycleInfraDay17 and how they relate to Glasgow’s Strategic Plan for Cycling 2016-2025. 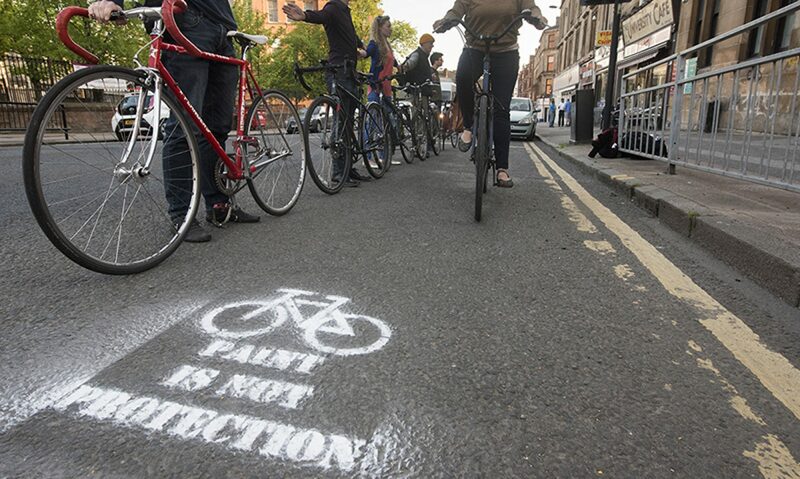 A similar approach will be taken when communicating this year’s submissions to Glasgow City Council, tying them in to the Strategic Plan for Cycling to help to identify areas which need increased focus. Finally (for now), where specific safety issues were identified, these will be raised directly, and individually, with the Council to ensure that they are rectified. Whilst all this is happening, the Tweets for #GlasgowCycleInfraDay17 have (so far as possible) all now been added to the CycleStreets.net. Have a browse; seeing them mapped across the city really highlights how much work people put in on the day to cover as much of the city as possible. So thanks again to everybody who took part.